“Virgin and Child With Pear,” at the Uffizi Gallery in Florence. Heritage fruit archaeologist Isabella Dalla Ragione says it’s not a pear. I loved reading about this side effect of an Italian woman’s work to preserve heritage fruits: she discovered that a fruit in a famous painting was mislabeled. “A closer look at Albrecht Dürer’s ‘Virgin and Child With Pear,’ at the Uffizi Gallery in Florence, for example, reveals a clear misnomer, Ms. Dalla Ragione said. Read more about her quixotic but intriguing work here. 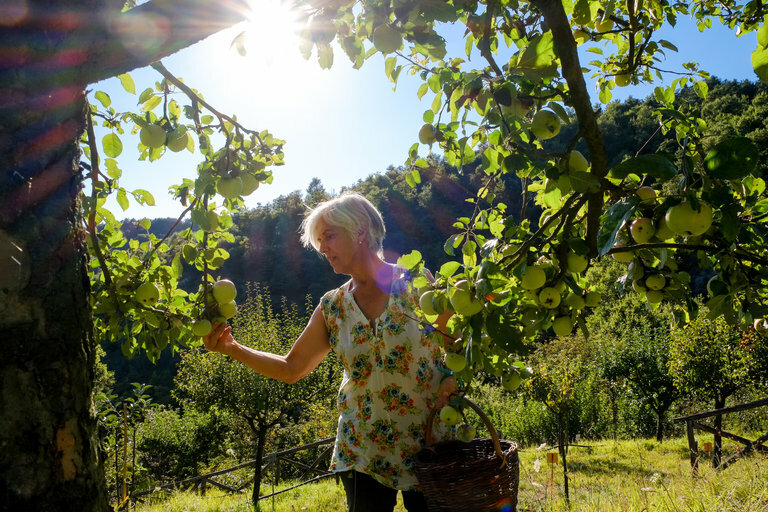 Isabella Dalla Ragione picking apples on her farmstead in San Lorenzo di Lerchi, Italy. Hurrah for this woman and her father and everyone who honors and protects genetic diversity! And hurrah for the people who do their own thing and follow their own star. I’ve read quite a bit about preserving heirloom fruits but hadn’t heard this angle, of using art as a source of info! Very interesting! What’s funny is that no matter how many scientific discoveries there may be, the title of a painting like that is going to stick.